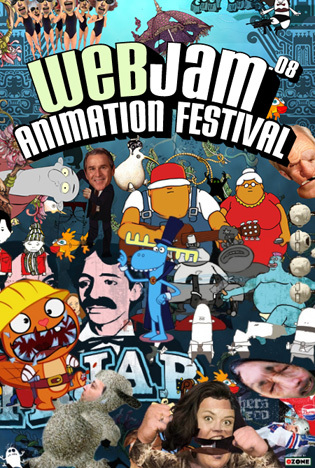 WebJam’s Original Trailer and the brand new, awesome Trailer #2 plus many other goodies can be found on the WebJam website. .
WebJam will be held at the Coolidge Corner Theater, a restored Art Deco movie palace that has been showing movies since 1933. Tickets will be available online at the Coolidge website and can also be purchased at the door. Shows are at 7pm Thursday May 22nd for $8.50 or $7.75 for the encore midnight shows on Fri and Sat, May 23-24. Enjoy your favorites on the big screen! Get your tickets early! If you’re in Boston at this time, hope to see you there. This entry was posted on Monday, May 5th, 2008 at 2:21 pm	and is filed under Uncategorized. You can follow any responses to this entry through the RSS 2.0 feed. You can leave a response, or trackback from your own site. So, I would love to make an animation with you. as an intro to Color Management, using the Colormunki. A spoof on returning something you ordered from a catalog, but the color didn’t match, so you returned it. I can meet you at the festival – live in California, but can come.